Why is it that we don't use savory tarts as main courses more often? They often begin a meal or get their due as luncheon fare, but the truth is that they make fabulous entrees for supper, especially in the summer. The secret to a good tart is two-fold: You want a tender, flaky crust paired with a complementary filling. The Zucchini, Goat Cheese and Bacon Tart featured today is a winner on both fronts. Its buttery rich dough gets a quick baking; then the pie shell is filled with a glorious custard of eggs, goat cheese, and heavy and sour cream. Once the filling is baked, it is topped with golden sauteed zucchini slices and a sprinkling of bacon and snipped chives. Rich and satisfying, this all-in-one main course, equally good warm or at room temperature, is perfect for a dinner for four on the patio (double it easily for a larger group). Pair it with a green salad tossed in vinaigrette and a crispy baguette as sides, then finish with lemon sorbet garnished with blueberries and mint, and you've got a simple yet delicious menu to for warm weather entertaining. Serves 4 as a main course or 6 to 8 as a starter. For crust, place flour, salt and butter in a food processor fitted with metal blade. Pulse until dough resembles coarse meal. With machine running, add egg mixture through feed tube. Then gradually add 1 to 2 more tablespoons ice water through tube until dough is moist but not lumping together. (Amount of water needed depends on dryness of flour.) Gather dough into a ball and place on a lightly floured work surface. Using the heel of your hand, smear 1/4 of the dough across the surface into a long, thin strip. Repeat with remaining dough. Gather dough together and shape into a disk. Wrap in plastic wrap and refrigerate 30 minutes. Roll dough out on lightly floured surface into a 14- inch round. Carefully transfer to 9-inch tart pan with removable bottom. Trim overhanging dough to1 inch. Fold overhanging dough in and press to form double-thick sides, rising about 1/2 inch above sides of pan. Pierce bottom of dough with fork. Wrap tart in plastic wrap and freeze 30 minutes. Arrange rack at center position and preheat oven to 400 F.
Bake until crust is golden brown, piercing with fork if dough bubbles up, about 20 minutes. Remove and cool 5 minutes. Lower temperature to 375 F.
In a bowl, whisk together eggs, cheese, cream, sour cream, 1/8 teaspoon salt and cayenne pepper. Pour in shell and bake until filling is set, 20 to 25 minutes. Remove and cool 10 minutes. In a large, heavy skillet set over medium heat, fry bacon until crisp. Drain on paper towels and crumble coarsely. Discard drippings and return pan to medium heat. Add oil and, when hot, add enough zucchini slices to fit comfortably in a single layer. Saute until golden and tender, using 2 forks to turn several times, 4 to 5 minutes. Drain zucchini on paper towels and season with salt. Continue with remaining zucchini, adding more oil if needed. Arrange zucchini on top of tart in concentric circles. Serve warm immediately or at room temperature. Tart can be prepared 4 hours ahead; leave uncovered at cool room temperature. 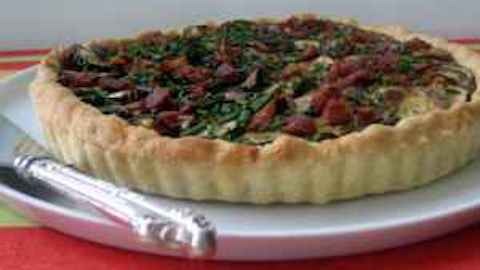 Recipes: "Zucchini, Goat Cheese and Bacon Tart Recipe "